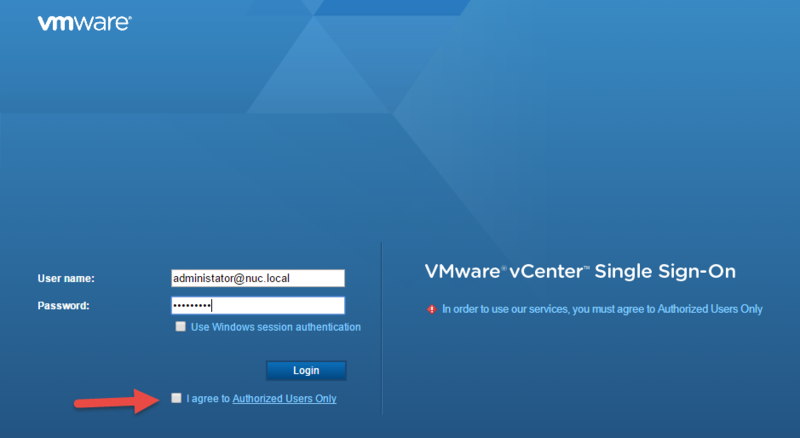 Senior Staff Engineer Peter Shepherd discusses privileges, roles, and permissions, and demonstrates how to create a virtual machine administrator role in the vSphere Web Client. 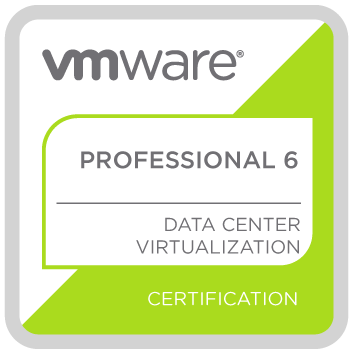 VMware vSphere® virtual machine encryption (VM encryption) is a feature introduced in vSphere 6.5 to enable the encryption of virtual machines. VM encryption provides security to VMDK data by encrypting I/Os from a virtual machine (which has the VM encryption feature enabled) before it gets stored in the VMDK. In this paper, we quantify the impact of using VM encryption on a VM’s I/O performance as well as on some of the VM provisioning operations like VM clone, power-on, and snapshot creation. We show that while VM encryption can lead to bottlenecks in I/O throughput and latency for ultra-high-performance devices (like a high-end NVMe drive) that can support hundreds of thousands of IOPS, for most regular types of storage, like enterprise class SSD or VMware vSAN™, the impact on I/O performance is very minimal. VM encryption supports the encryption of virtual machine files, virtual disk files, and core dump files. Some of the files associated with a virtual machine like log files, VM configuration files, and virtual disk descriptor files are not encrypted. This is because they mostly contain non-sensitive data and operations like disk management should be supported whether or not the underlying disk files are secured. 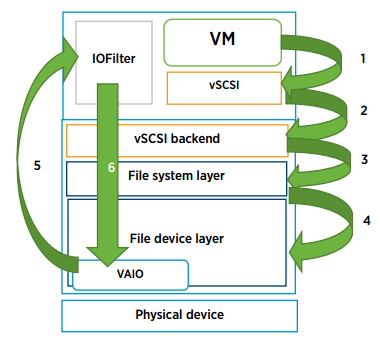 VM encryption uses vSphere APIs for I/O filtering (VAIO), henceforth referred to as IOFilter. IOFilter is an ESXi framework that allows the interception of VM I/Os in the virtual SCSI emulation (VSCSI) layer. On a high level, the VSCSI layer can be thought of as the layer in ESXi just below the VM and above the VMFS file system. The IOFilter framework enables developers, both VMware and third party vendors, to write filters to implement more services using VM I/Os like encryption, caching, and replication. This framework is implemented entirely in user space. This allows the VM I/Os to be isolated cleanly from the core architecture of ESXi, thereby eliminating any potential issues to the core functionality of the hypervisor. In case of any failure, only the VM in question would be affected. 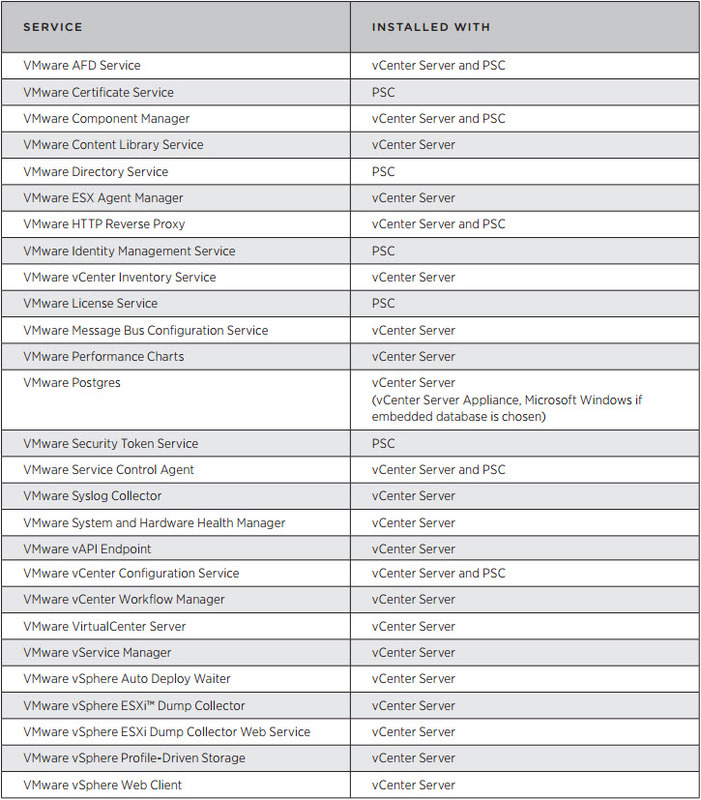 There can be multiple filters enabled for a particular VM or a VMDK, and these filters are typically chained in a manner shown below, so that I/Os are processed by each of these filters serially, one after the other, and then finally either passed down to VMFS or completed within one of the filters. This is illustrated in Figure 1. The primary purpose of VM encryption is to secure the data in VMDKs, such that when the VMDK data is accessed by any unauthorized entity, it gets only meaningless data. The VM that legitimately owns the VMDK has the necessary key to decrypt the data whenever read and then fed to the guest operating system. This is done using industry-standard encryption algorithms to secure this traffic with minimal overhead. While VM encryption does not impose any new hardware requirements, using a processor that supports the AES-NI instruction set would speed up the encryption/decryption operation. In order to quantify the performance expectations on a traditional server without an AES-NI enabled processor, the results in this paper are from slightly older servers that do not support the AES-NI instruction set. Figure 2 shows the various components involved as part of the VM encryption mechanism. It consists of an external key management server (KMS), the vCenter Server system, and an ESXi host or hosts. vCenter Server requests keys from an external KMS, which generates and stores the keys and passes them down to vCenter Server for distribution. An important aspect to note is that there is no “per-block hashing” for the virtual disk. This means, VM encryption provides data protection against snooping and not against data corruption since there is no hash for detecting corruption and recovering from it. For more security, the encryption takes into account not only the encryption key, but also the block’s address. This means two blocks of a VMDK with the same content encrypt to different data. To visualize the mechanism of encryption (and decryption), we need to look at how the various elements in the security policy are laid out topologically. The KMS is the central server in this security-enabled landscape. Figure 3 shows a simplified topology. The KMS is a secure centralized repository of cryptographic keys. 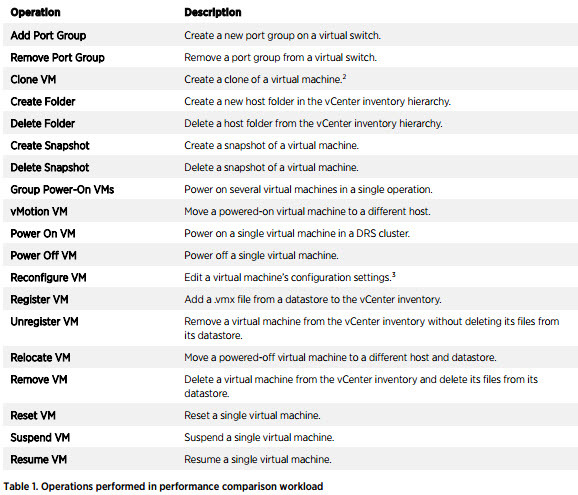 There can be more than one KMS configured with a vCenter Server. However, they need to be configured such that only KMSs that replicate keys between themselves (usually from the same vendor) should be added to the same KMS cluster. Otherwise each KMS should be added under a different KMS cluster. 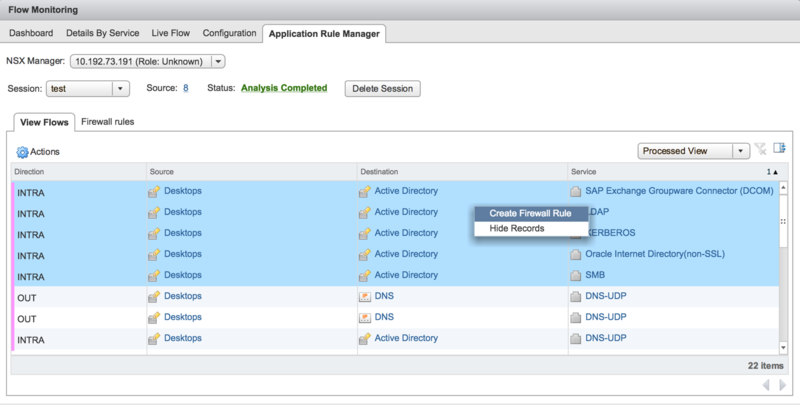 One of the KMS clusters must be designated as the default in vCenter Server. Only Key Management Interoperability Protocol (KMIP) v1.1 compliant KMSs are supported and vCenter Server is the client of KMS. Using KMIP enables vCenter Server to talk to any KMIP compliant KMS vendor. Before transacting with the KMS, vCenter Server must establish a trust connection with it, which needs to be done manually. 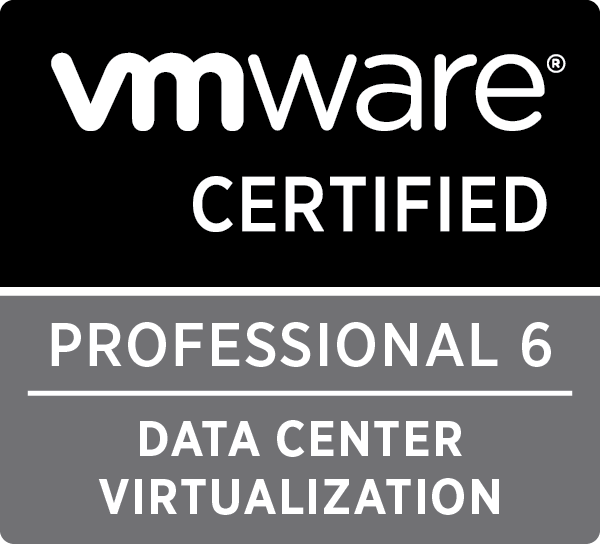 Download a full VMware vSphere Virtual Machine Encryption Performance vSphere 6.5 Guide. The Embedded Host Client (EHC) started out as a fling and now is a supported product in vSphere 6.0 Update 2. The EHC is now installed as part of ESXi 6.0U2 and provides the ability to manage any ESXi host using a web browser. After a host is installed with or upgraded to 6.0 U2, open a web browser and enter https://”FQDN or IP of host”/ui. More information on the Embedded Host Client can be found by reviewing the release notes. In this video, we’ll look at how to use VMware vSphere HA to protect virtual machines. 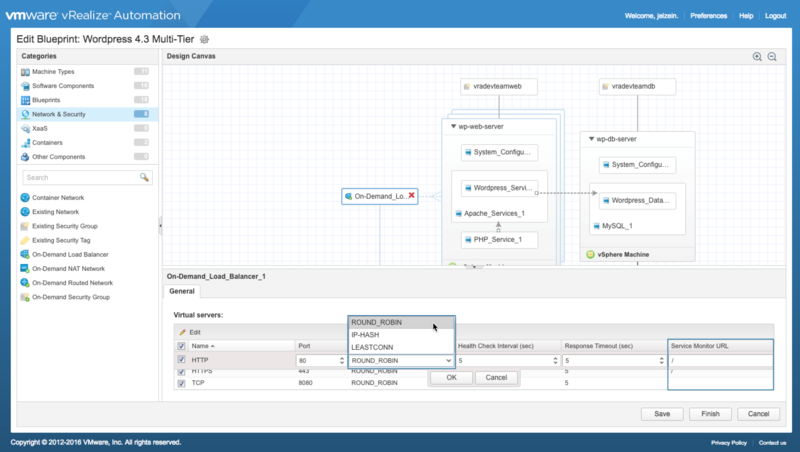 VMware vSphere HA protects virtual machines from three types of failures. It will protect you if the ESX host the VM’s running on fails, if the guest OS inside the VM fails, or if an application inside the VM fails.